CommanderNili had the most liked content! 209-1100 (Glafkos Class) Submarine for Hellenic Navy This submarine dates back to the Virtual Sailor Days. I had sent it to only a few VS Forum friends who could actually appreciate military vehicles and submarines in particular. She has been altered and prepared for VSF and is dedicated to this friendly site and its administrator. 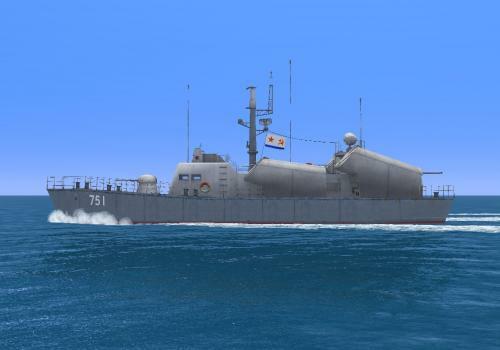 Weapons (VSF add-on): 1 SonarPing (Sound Effect only) 2XSHKVAL super fast guided torpedoes 2XSUT guided torpedoes 2XMK14 unguided torpedoes 2XDM2A4 guided torpedoes This boat has elements. She comes with a fully functional interior (control room). The boat features many animations in order to resemble the functionality of a real sub within the limits of VSF. Animated parts as follows: Glass Windscreen: Appears-Disappears with Ctrl-A Flag with pole: Raised and Lowered with Ctrl-D Periscopes (Search & Attack): Raised and Lowered with PgUp-PgDn ESM and Rotating Radar: Appear-Disappear with Ins-Del Snorkel Mast: Lowered and Raised as Sliding Door (With Mouse on OR Shift-S for animations panel and then press Slide Doors) The guided torpedoes can lock on targets and be fired. All of the instruments are specifically designed and implemented for this unique model. Try to view the interior in the darkness to experience the emmissive panel. 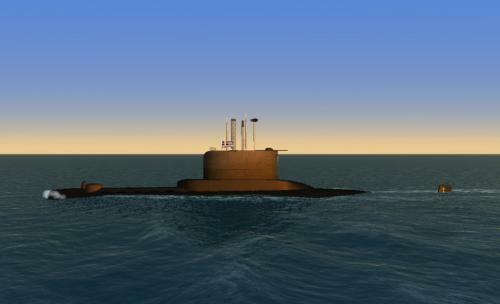 Realistic sounds have been included for a true immersive submarine experience. CREDITS Many credits go to George Mastrogeorgiou for the realistic textures of the hull and also for the finishing touch in the 3D model itself. Credits go to Sppokymufu ( I guess) for some of the instruments. It's been so many years that I don't remember for sure, but I think that some of the instruments come from Spookymufu's subs. Enjoy! 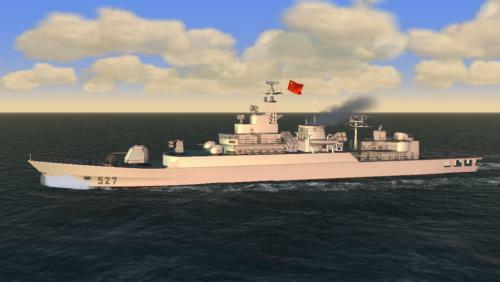 This is a Jiangwei II class Frigate (Luoyang-527) for VSF. This boat has elements. She comes with a basic but functional bridge. The boat features animated hand-rails for helipad.  The animation is activated with Ctrl-A. She bears an animated Chinese flag and she has one standard VSF rotating radar. Other animations also exist: Sliding Hangar door (mouse on and slide sideways), Bridge doors (Ctrl-D), Bow Flagpole (PgUp-PgDn). This boat carries 4 YJ-83 Surface missiles that can lock on targets and be fired. Just make sure that prior to the missile launch your target ship is in your beam with a relative bearing 65 degrees up to 115 degrees off your bow. You can fire the missiles from the weapons panel or by bringing up the HUD (Shift-H) so that you can hear the lock on sound. Other weapons are also playable and loaded with near to real life data (inside the weapon.cfg). Realistic sounds have been included (engine, interior, start, stop). Enjoy! 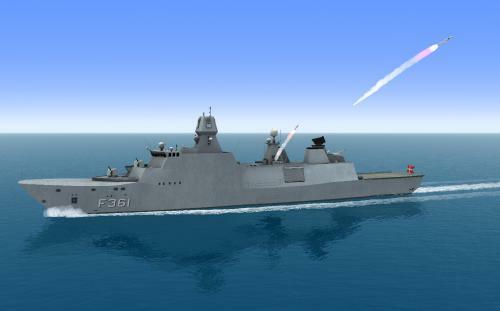 This is OSA I class missile boat for VSF. The Osa class is probably the most numerous class of missile boats ever built, with over 400 vessels constructed between 1960–1973 for both the Soviet Navy and for export to allied countries. This boat has elements. She bears an animated flag and a working radar. She also has animations: CTRL-A: Open & Close the 4 launcher-box lids. CTRL-D: Open & Close the bridge door. Pg Up - Pg Down: Lower and Raise the bow flag pole. The missile launcher is animated and it can be raised prior to missile firing with Ctrl-A. This boat carries 4 SS-N-2 (Styx) missiles with accurate specs (as much as possible). They can lock on targets and be fired. Just make sure that prior to the missile launch you face your target ship with a relative bearing -25 degrees up to 25 degrees off your bow. You can fire the missiles from the weapons panel or by bringing up the HUD (Shift-H) so that you can hear the lock on sound. The AK-230 guns are also playable and loaded with near to real life data (inside the weapon.cfg). A broken.x version is also included for dramatic sinking. Finally this vehicle has instruments on 2 bridges (inner and outer) In general she is fun to play with. 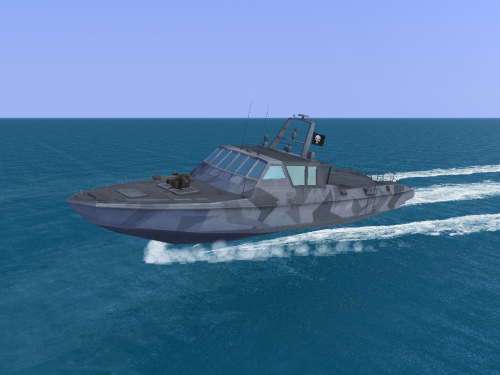 This is a Mark V Special Operations Craft (Mark V SOC) for VSF. This craft was introduced into service with the US Navy SEALs in 1995. The primary mission of the Mark V is medium range insertion and extraction platform for Special Operations Forces (primarily SEAL combat swimmers) in a low to medium threat environment. The secondary mission is limited Coastal Patrol and Interdiction, specifically limited duration patrol and low to medium threat coastal interdiction. This boat has elements. She bears an animated "Punisher" skull flag and a working radar. The Mini gun is also playable and loaded with near to real life data (inside the weapon.cfg). This boat comes with interior and panel. This is RFN Stoikiy for VSF. She is a "Steregushchiy" (vigilant) class corvette of the Russian Navy. This boat has properties. 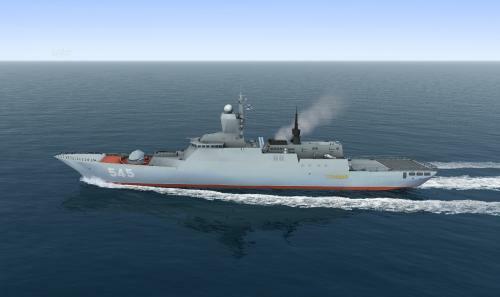 She bears an animated russian federation navy flag, a working radar and animated handrails for the helipad. The latter can be raised or lowered with Ctrl-A. The A-190 gun and the 2 AK-630 are playable and operative in VSF. Also this boat carries 4 SS-N-25 missiles that can lock on targets and be fired. Their properties for this add-on are very similar to Harpoon. Just make sure that prior to the missile launch your target ship is in your respective beam (port or starboard) with a relative bearing 65 degrees up to 115 degrees off your bow. You can fire the missiles from the weapons panel or by bringing up the HUD (Shift-H) so that you can hear the lock on sound. I have not included an interior yet. It may be done in the future. 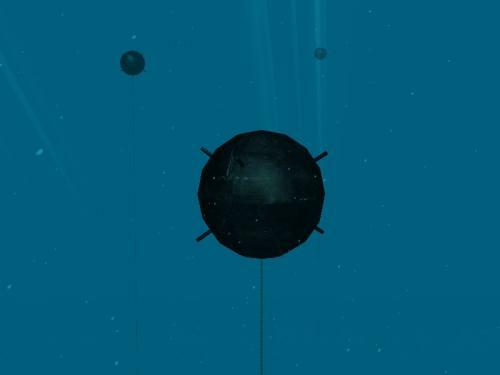 This add-on simulates an influence mine. Although it sounds awkward it works! The mine is actually a submarine inside VSF, in the size and shape of a EMC mine (German WWII mine). In order to work it must be loaded with the "mine.txt" script that comes in this package. The mine can be drifted or moored, surfaced or submerged. The tricky part is to adjust the correct depth with proper ballast. You may use the "Minefield" situation as a starting point. Once loaded with the script the mine stays in position and waits. Once a surface or sub contact enters in a range of 40 yards (measured from the center of the ship) the mine fires its own weapon which explodes immediately. The mine then breaks and explodes completing the effect. 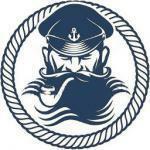 The blow is devastating and can lift a ship off the surface of the sea. The engagement range (sensitivity of mine) can be adjusted inside the script.txt. Just tweak the number that comes after "range" Bonus Pack: My version of a great white shark to populate your VSF worlds.